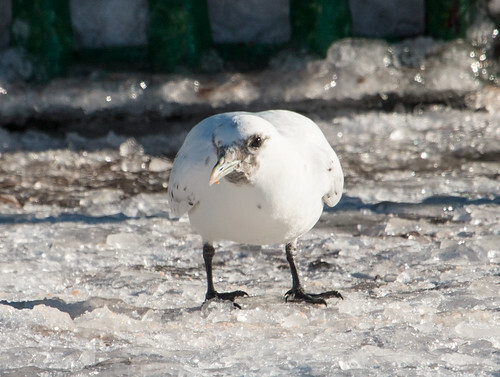 Ivory Gull photographed 6 January 2016 at Canal Park. Notice flecks on the crown. It was the best of times. It was the worst of times. It was the best of times again. Today was surreal. I woke up to read Sam Cook’s article in the Duluth News-Tribune about Duluth’s Ivory Gull—Sam had been out of town until yesterday, but put together the story at the last minute, using one of my photos. Then I went to my computer to read an email from Bryan Murdock who had found a dead Ivory Gull last night at Connors Point in Superior when he was photographing the sunset. 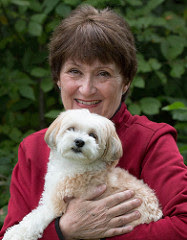 What heartbreaking news, with such ironic timing! 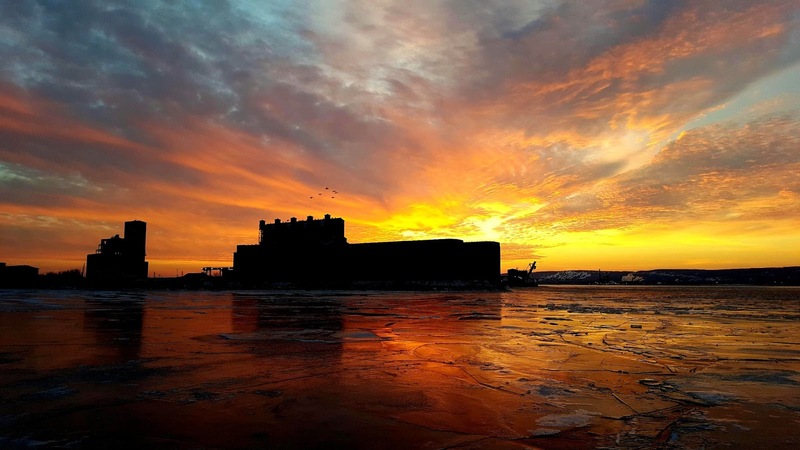 Which is more ironic: Bryan's finding the gruesome remains when he went out to photograph this gorgeous sunset, or my getting news that the Ivory Gull was dead right after reading the story about it in the paper? Photo Copyright 2016 by Bryan Murdock; all rights reserved. 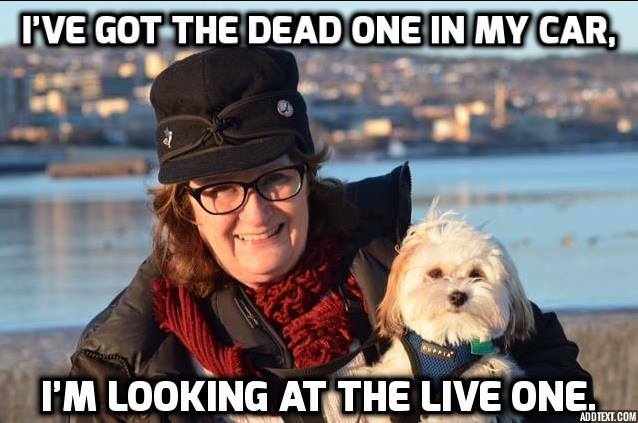 Lots of people had been planning on making the trip to Duluth to see the gull, so I posted the sad news on the Minnesota Ornithologists’ Union’s Facebook page, and also the American Birding Association’s and my own Facebook pages. 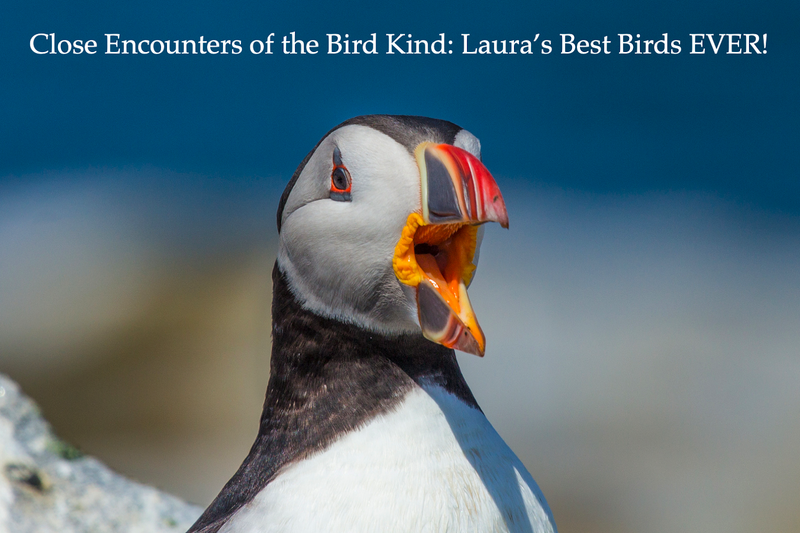 Birders who hadn’t yet seen it were both disappointed and sad; those who had already seen it felt both relieved and sad. 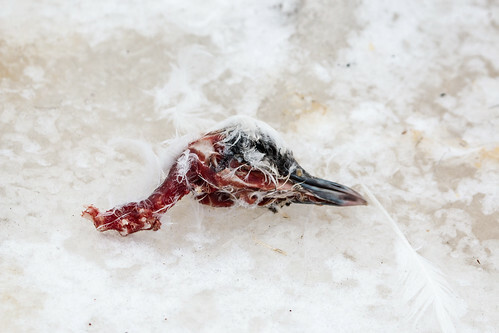 It seemed a tragic waste to leave the carcass of such a valuable bird in the snow for scavengers, so I got directions from Bryan on the phone and headed to Superior to retrieve the specimen with my friend Erik Bruhnke. It’s of course illegal to possess wild birds or their parts without a salvage permit; this bird was going to be sent to a museum post haste. Bryan Murdock, who discovered the carcass, works at AMI Consulting Engineers on Connors point. He was out of town today, but a couple of his co-workers came out to help us find the poor thing. And finally, there it was. The tragic scene--almost identical to when Bryan Murdock photographed it last night. No feet, tail, or keel with pectoral muscles. 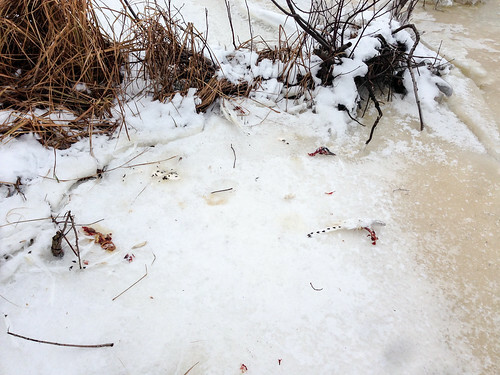 Bryan had noticed tracks of a coyote or fox at the carcass last night, but there was no way of knowing if the bird had been roosting on the ground when it was killed or if had been dropped by a Bald Eagle, knocked out of the sky by a wintering Peregrine or Gyrfalcon—both species have been regularly seen in that area—or what. 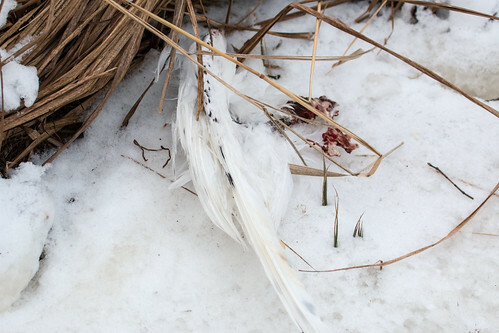 Feathers hadn’t been stripped from the carcass—the actual eating had apparently been done by a mammal. Erik and I took photos on site before retrieving the parts. I took some more detailed photos at home. Then I brought the carcass to Nathan Goldberg, who just happened to be birding in Duluth today. He’s a student at Cornell who has a salvage permit for the Field Museum of Natural History in Chicago, my favorite museum of all. My own salvage permit has expired, so it would have been inappropriate and illegal for me to keep it while waiting for a chance to bring it anywhere on my own. 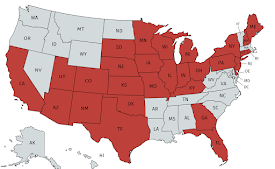 Some Minnesota birders are distressed that it didn’t go to the Bell Museum in the Twin Cities (though the carcass was found in Wisconsin), and some Wisconsin birders are upset that it didn't go to a museum in Wisconsin, but to stay within the law, time was of the essence. I'd sent out a request on Facebook asking if anyone wanted to retrieve the specimen, and no one else offered, so the decision about what to do with it was mine. 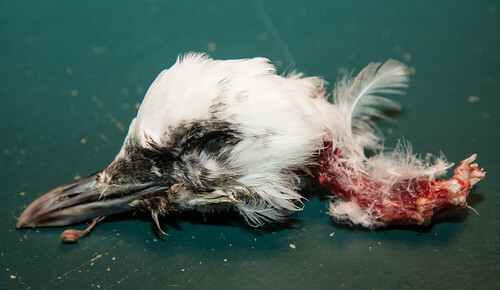 Anyway, during the Great Gray Owl irruption in 2005, it was the Field Museum that collected the dead birds and did necropsies on them, and my interactions with scientists there have always been wonderful, so I’m glad that’s where the poor bird will end up. 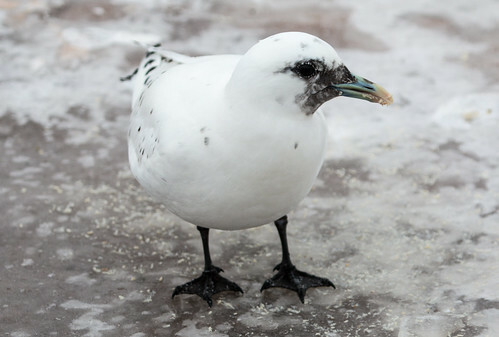 When Erik and I returned to the car after retrieving it, we both had messages that people were seeing an Ivory Gull at Canal Park right that moment. 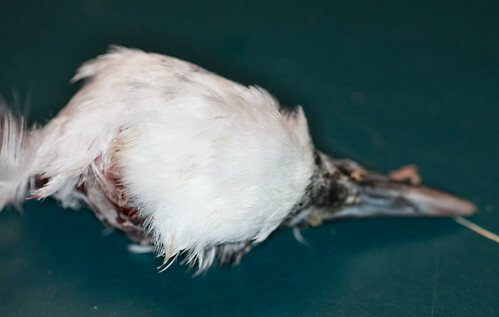 Our carcass was an immature Ivory Gull, as was the bird at Canal Park. But there were two! We headed straight to Canal Park and got more photos—happy ones this time! Sam Cook called me while I was at Canal Park. I'd emailed him about the dead gull, and now he was hearing there was still one at Canal Park. That's how he got this quote out of me. On December 30, Scott Wolff saw a “white gull” off the end of Park Point while walking his dog. 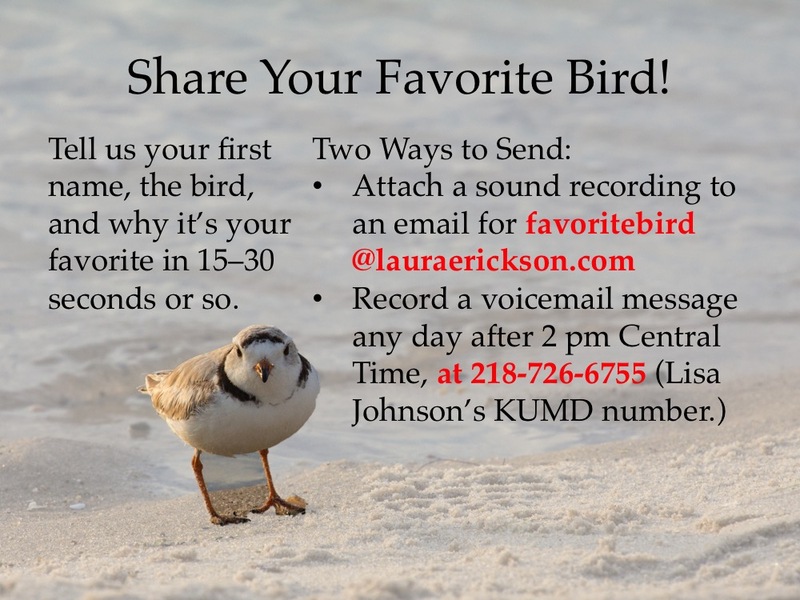 He didn’t send out a general alert, but did message Peder Svingen and Mike Furtman about the bird. 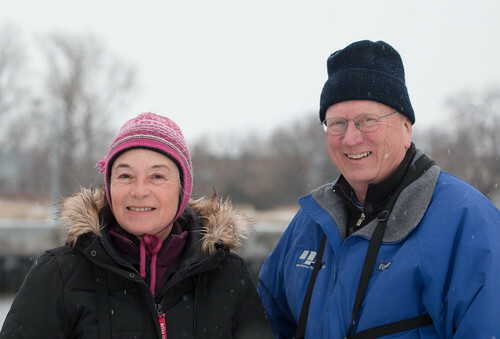 Peder let some other active gull watchers in Duluth know to watch for it. 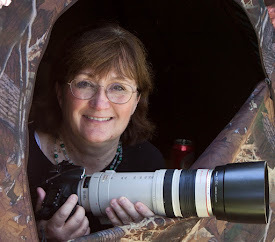 No one had a chance to photograph that bird. Two Red-tailed Hawks flushed hundreds of birds from the compost pile at WLSSD. We were scanning the birds and trying to identify everything we could for eBird documentation. A small gull separated from the bird cyclone and headed our way. We could see the bird was different from everything else and had a black face and black spots along its wings and tail edge. It moved with a very graceful buoyant flight. When it flew past us, 50 feet up, we could clearly see it was an Ivory Gull headed for Canal Park or at least Lake Superior. 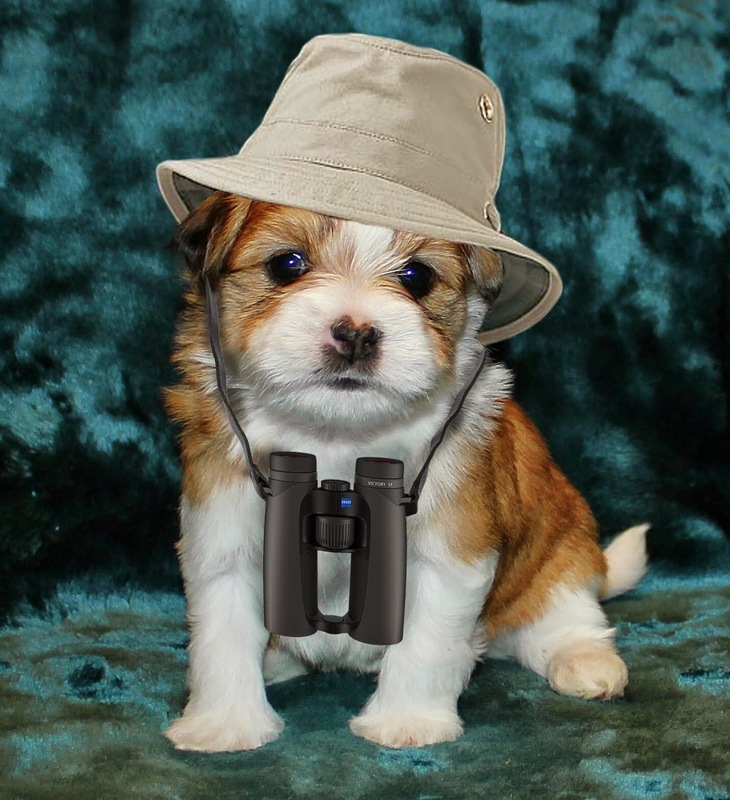 We sent a text to the local birders and the hunt was on. The Kraemers: Founders of the Feast! The moment I got the word, I grabbed my camera, binoculars, and little dog Pip and charged straight to Canal Park. I took over 700 photos of it the afternoon of the first. Russ and I went back the next day and I took a bunch more photos. 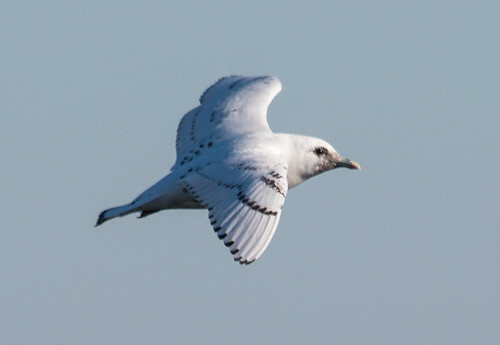 Ivory Gull on January 2. Notice the flecks on the crown. The bird seemed to fall into a pattern of appearing at daybreak, rewarded by birders tossing it food. After eating its fill, it would loaf on the shipping channel wall or fly out to the water with other gulls. Every now and then an eagle would fly over, and the gulls would scatter. At this point it might disappear for an hour or two, but would return to the shipping channel in mid-afternoon. This was the pattern from January 1st through the 6th. 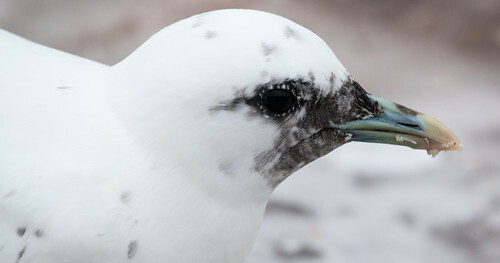 I photographed an Ivory Gull at Canal Park on the 1st, 2nd, and 6th. The bird on the 2nd seemed a little different from the one on the 1st—the bill didn’t seem as strongly bi-colored. At the time I figured it was just the lighting, because how could there possibly be two different ones? In retrospect, I was right. It really was the lighting—on all three occasions, my photographs show a few flecks on the crown. There were no flecks at all on the crown of the dead one. Notice the pure white crown. Also, closely examining the photos from the 2nd, I can see both the greenish base of the bill and the yellowish tip, just not as clearly as in the better light on the 1st and 6th. On the carcass, the bill really was more uniform, though it’s possible that that was due to color changes after death. Other birders may have gotten photos of the second gull, but it seems most likely that the bird at Canal Park has been the same individual from the start. The one found dead in Superior may be the one Scott Wolff first saw on the 30th—there is no way of knowing for sure, and there's no way of knowing when it died, either. 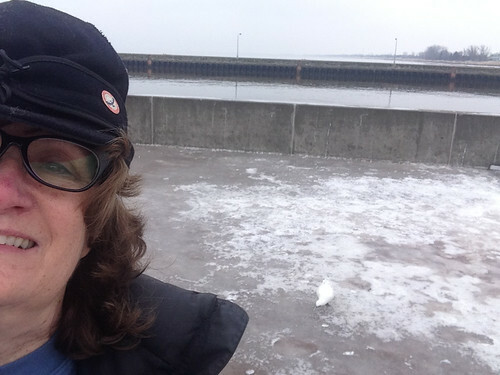 It’s extraordinary that even one Ivory Gull would turn up in Duluth. I’m really glad that the bird that was so cooperative and gave me so many lovely photos is still among the living. 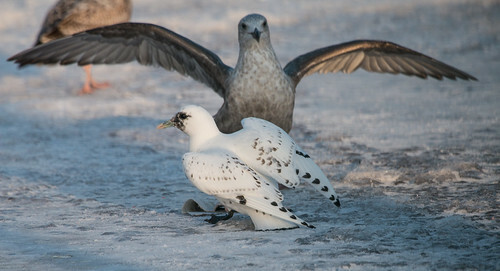 As sad as I am that the other Ivory Gull is dead, I’m glad that Bryan Murdock discovered it and that its body will provide valuable information for ornithologists. 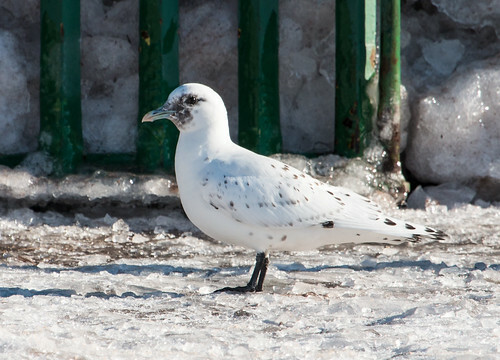 Meanwhile, I hope that any birders who want to see an Ivory Gull in Duluth get to enjoy the one we have. Sam Cook wrote a second article after he found out about the dead one, and the living one. *I don’t approve of luring owls to humans for food—owls are natural hunters that shouldn’t learn to associate humans with foods. 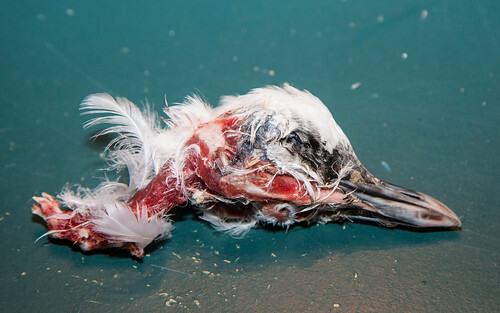 Gulls are natural scavengers that in nature are drawn to large mammals, including humans, to opportunistically take what they can get, so the ethical issues of feeding gulls seem to me to be entirely different from those related to owls. 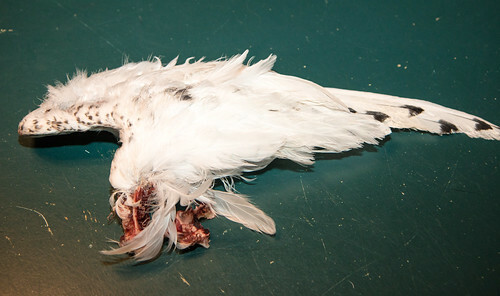 In the specific case of Ivory Gulls, even very old resources refer to them as “tame.” In the Arctic, they appropriate bits of food from kills by seals and polar bears, so if they grab a bit of fresh fish from people, that seems fine to me. This is such a well done synopsis of the Ivory Gull drama that's been taking place in your own backyard. Whether I'm able to make the trip or not, I've appreciated the narratives that help me feel like I was there. Thank you! Thanks for sharing this, Laura! Just heard it on WTIP.